The “down under” Cowboy « Hercules and the umpire. You may recall the post entitled Fun of Flying. 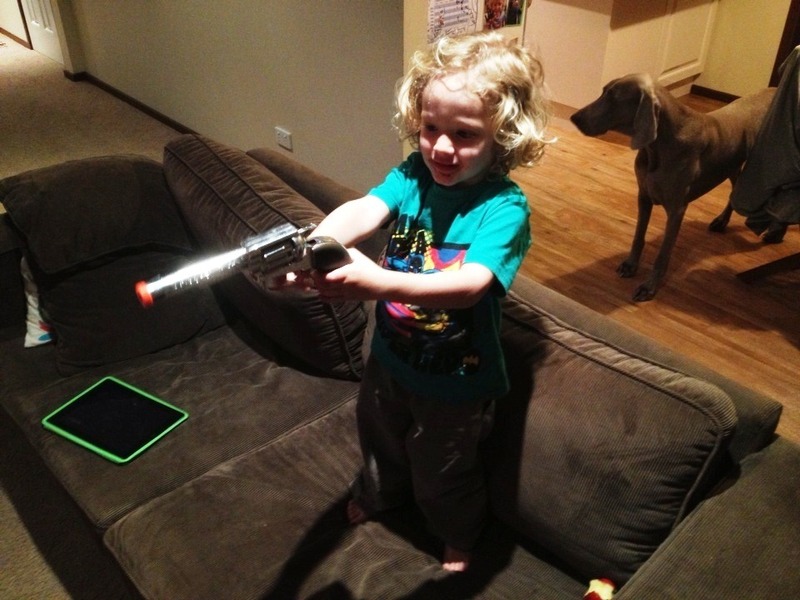 Keller returning to Australia with a cowboy outfit purchased for Fletcher by Aunt Marne in ABQ ran into the Aussie dislike for toys that vaguely look like real guns. Anyway, that made me mad. It seems that Toys-R-Us is ubiquitous. In any event, it has an operation in Australia. For $9.99 (AUS) plus $11.00 for shipping I was able to obtain the “Peacemaker” for Fletcher. 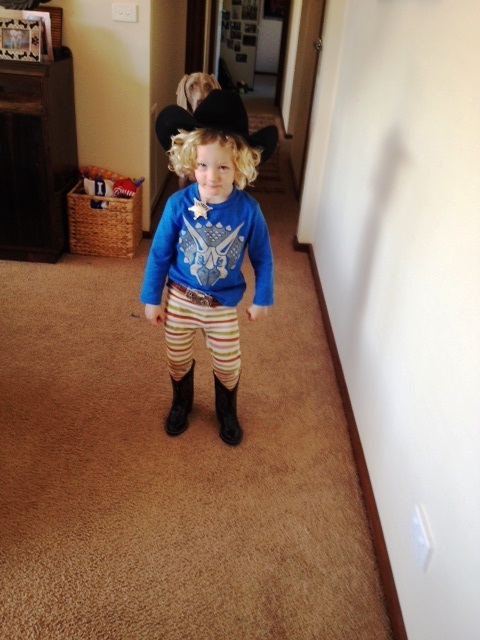 With his hat and boots, it was a hit. The odd thing is that the “Peacemaker” looks very much like the Single Action Army, SAA, Model P, Peacemaker, M1873, circa 1872. Why you can buy this replica in Australia but get it (or something like it) confiscated at the Sydney airport is a mystery. I guess that’s just the “land down under.” Anyway, that was my excuse for adding the video of “Men At Work – Down Under” (“Did you hear the thunder? You better run for cover!”) at the end of this post. I absolutely love that song and the video is quirky just like the marvelous country. May Fletcher always contribute to that thunder! Australia wouldn’t be the same without it. 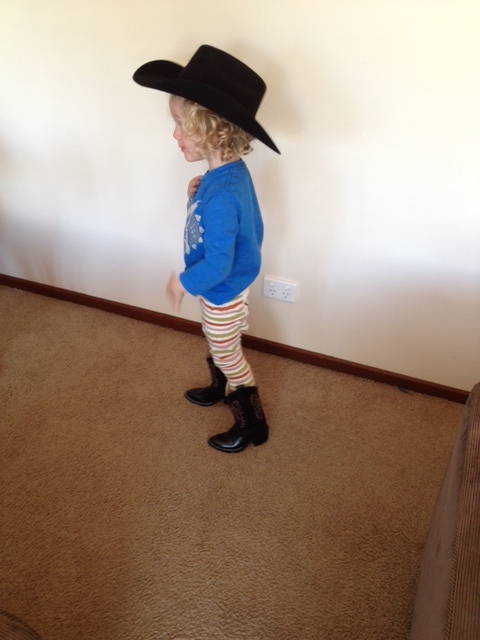 Fletcher in his cowboy outfit with a mystified Ruben in the background. Fletcher with the “Peacemaker.” Ruben looking out for bandits. That is an awesome outfit! I love the striped pants. Great tactics, too! In the time it takes to register and appreciate the incongruity, he can draw a bead on you. Why you can buy this replica in Australia but get it (or something like it) confiscated at the Sydney airport is a mystery. Where’s Fletch’s holster, strapped down low on his thigh, so that hogleg’s grip is just above hand height? Eric, I think that is against the law in AUS. The long and the short of it is that bringing guns, or things that look like guns, across national boundaries is something fraught with legal issues. You might not run into that issue much in Nebraska, but it’s quite real. Even for folks like Fletch.